A Skagit County business has received more than $3.9 million in federal money - through a combination of grants and loans - for an anaerobic digester in Lynden that would turn cow manure into renewable energy. Known as Farm Power Lynden, the proposed project at 8421 Bob Hall Road would be the second anaerobic digester in Whatcom County. The digester would take manure from more than 2,000 dairy cows in Whatcom County, trap methane gas from the decomposing manure, and burn the gas to generate enough electricity to power 500 homes. The company behind it is Farm Power Northwest, which already has a commercial digester near Rexville in Skagit County. That digester began generating electricity Aug. 30. "We've wanted to do something in Whatcom County for a while. We started in Skagit County but always have been looking north. There's lots of cows and a lot of commitment to keeping agriculture going," said Kevin Maas, who founded Farm Power Northwest with brother, Daryl. The last funding piece fell into place with a $1.06 million grant made up of federal stimulus dollars funneled through the Washington state Department of Commerce. Gov. Chris Gregoire announced Monday, Oct. 5, that Farm Power Northwest was among those receiving more than $20 million in grants and loans for clean technology, renewable energy and energy efficiency programs throughout the state. Farm Power will combine those dollars with money it is getting from the U.S. Department of Agriculture - $500,000 in grants and $2.4 million in a loan guarantee. The actual loan would come from ShoreBank Pacific, which bills itself as the first commercial bank in the U.S. to commit to environmentally sustainable community development. U.S. Rep. Rick Larsen, D-Everett, lauded the USDA dollars, saying the money would create jobs in Whatcom County, support local family farms and reduce pollution. "It is a small but important investment towards achieving energy independence and creating green jobs in our region," Larsen said in a statement. Farm Power Lynden is expected to create 24 permanent and 44 temporary jobs, according to Gregoire's news release. The project has another benefit in that the excess heat created by the digester will be pumped over to a nearby greenhouse owned by grower Van Wingerden Inc. to warm it. "It's just one more thing we can do with our energy that's a win-win deal," Maas said. Much remains to be done before construction can begin on the digester, including permitting and locking down the manure supply as well as contracts to sell power. "It's still going to be months of work before we can do anything like groundbreaking," Maas said. When built, the anaerobic digester would be the second in Whatcom County. The one on Darryl Vander Haak's dairy farm - the first in Washington state - began supplying electricity to Puget Sound Energy in 2004. 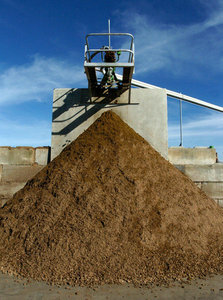 It processes manure from about 1,000 cows. At full capacity, it can generate enough electricity to power about 180 homes. Manure is pumped into a 1.5-million-gallon concrete tank, where bacteria break down some of the slurry in the absence of oxygen. The methane gas produced as the manure decomposes is captured by the tank's concrete roof, then burned in a modified diesel engine to turn an electrical generator, producing energy. The process also produces a nutrient-rich liquid, free of pathogens and odor, that can be spread on farm fields and a fiber that can be sold to nurseries as compost and plant bedding.